Brian Leslie Linton, aged 43, late of School Road, St. Barnabas. Former worker of Garnett Technologies Inc. 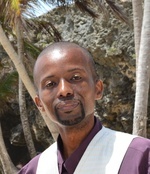 Member of the Barbados ICT Professionals Association and the Internet Society Barbados Chapter. Son of Marcia and Brian Linton. Father of Maya and Tara McCollin-Linton. Brother of Neil, Kim, and Janelle. Great-nephew of Mildred Holder, Pearline Jordan, and Marjorie Linton-Jones. Special friend of Tricia Skeete. Relative of the Linton, Holder, Hutson, Cumberbatch and Jordan families. The funeral of the late Brian Leslie Linton leaves Tudor’s Funeral Home, The Ivy, St. Michael on Thursday February 7th 2019, at 8:15am for the Bethel Methodist Church, Bay Street, St. Michael, where relatives and friends are asked to meet at 10:00 am for a Service of Thanksgiving. The cortege will then proceed to the Westbury Cemetery for the Interment. Mourning colours are optional. Flowers may be sent to Tudor’s Funeral Home, no later than 8:00am on Thursday. No viewing by special request.